I have to say that the camera on my iPhone 5s is awesome! It truly takes better pictures than my camera. 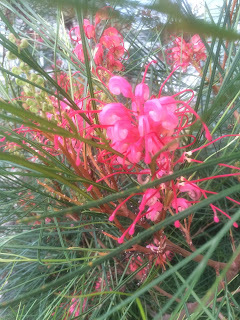 I can take a close-up shot, and there is no distortion or blurriness! 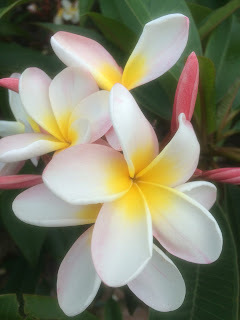 I took all of these pictures yesterday and today on my morning walk around the island. 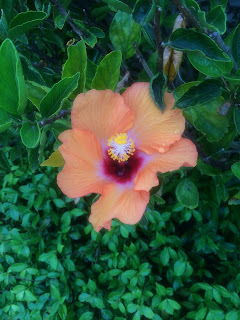 While it IS summer, we have flowers blooming all year long. This one seems to actually glow. 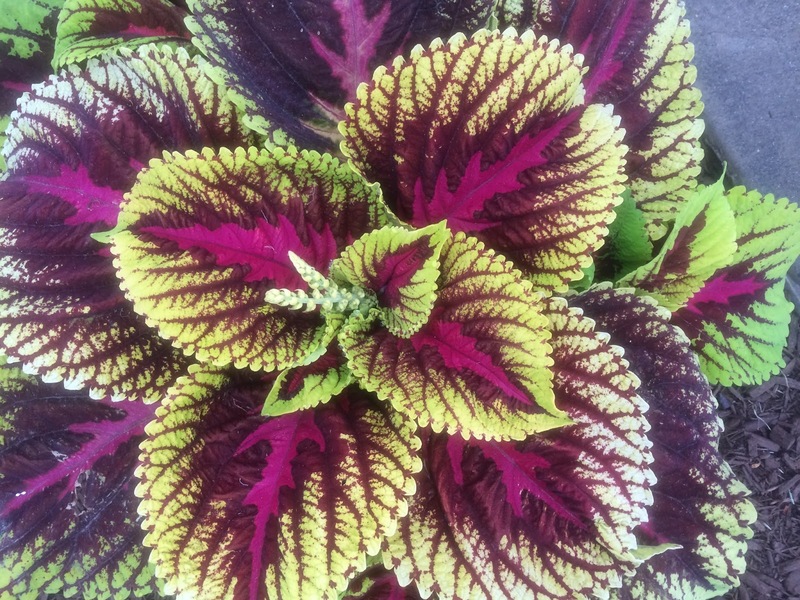 Don't know the name of this, but it sure is pretty. This plumeria has both pink and yellow, which I love. Another I do not know the name of, but thought if worthy of being included. 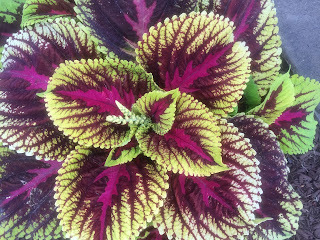 And the colors in this are so intense...just beautiful! 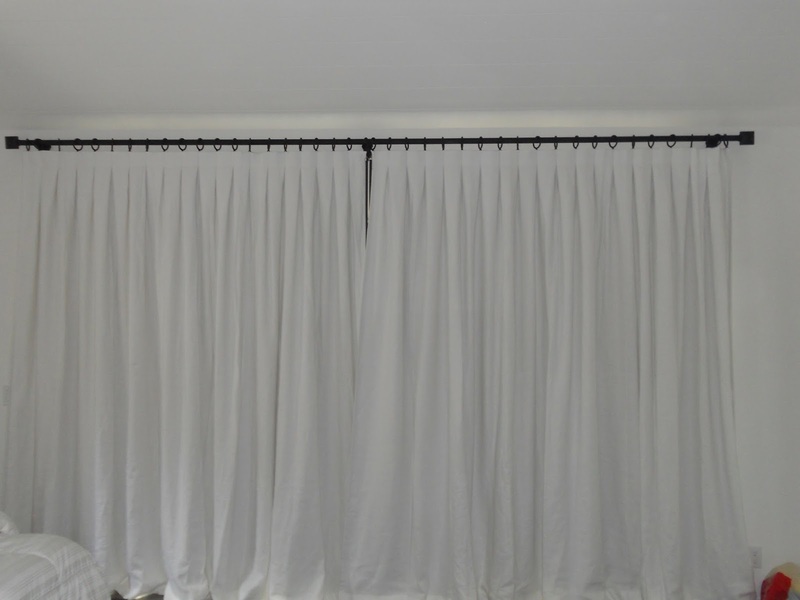 White linen, inverted pleats, lined with blackout and an expanse of 156" equals really, really heavy draperies! Really heavy and hard to manage, especially when making them. But, in spite of the challenge to make them and the lack of space I have to work on such a project, they look really lovely. 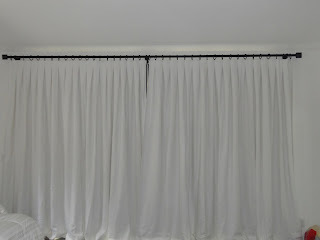 A closer view of the inverted pleats. Given how much fabric is in each side of the panels, they stack pretty well and leave a lot of the backyard visible. It's always better to have draperies lay on the floor. 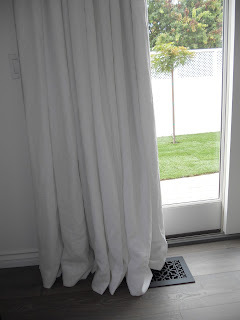 It isn't necessary to have a huge puddle (unless that's what you want) but when they are just above the floor, they have a way of looking like they are a tad too short. Plus, it is really hard to make everything perfectly even and this allows for that. 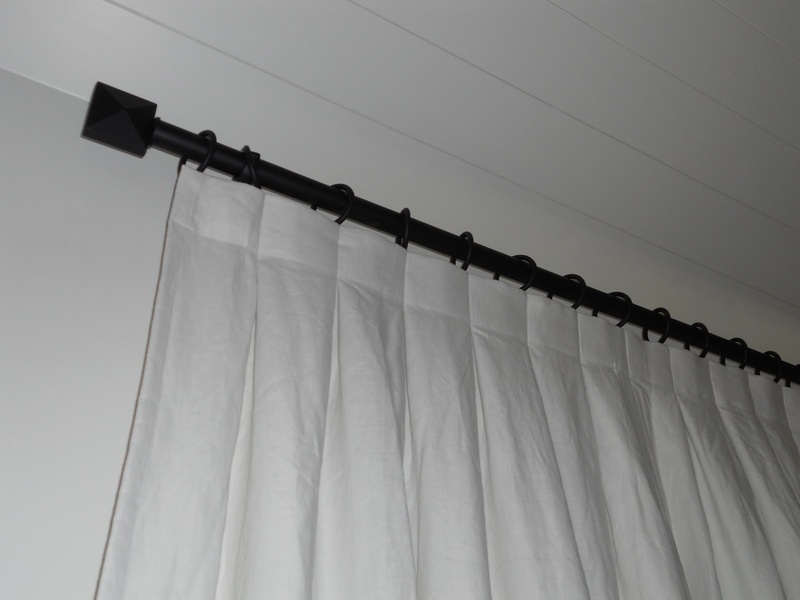 Also, there are two roman shades on either side of the huge bed, which no one told me about. 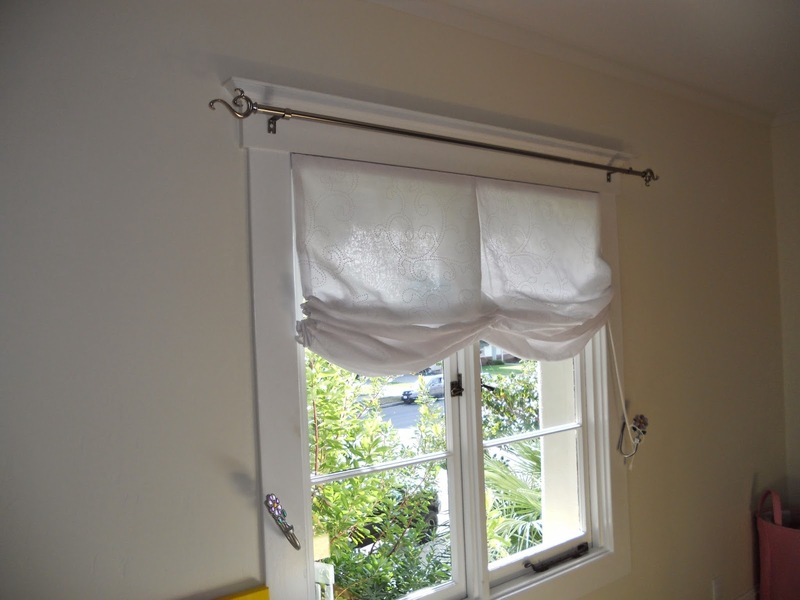 Because of that, there is a bit of an issue with the controls on the shades. Oh, well! When I measured there was not even drywall up yet, let alone any furniture in the room. 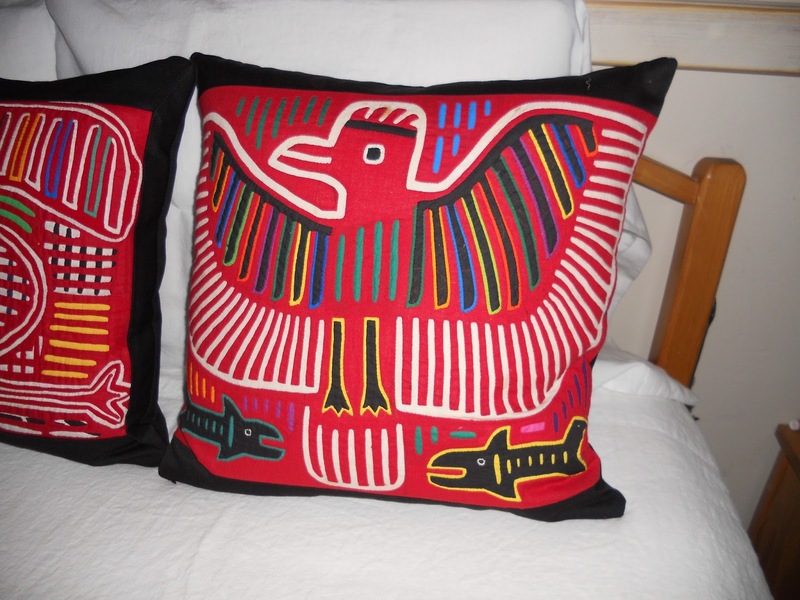 My client brought me these brightly colored, appliquéd pieces that she bought in Panama and wanted me to make her pillows from them. She chose a black Sunbrella for front borders and the backs. The village scene above was actually on a purse. 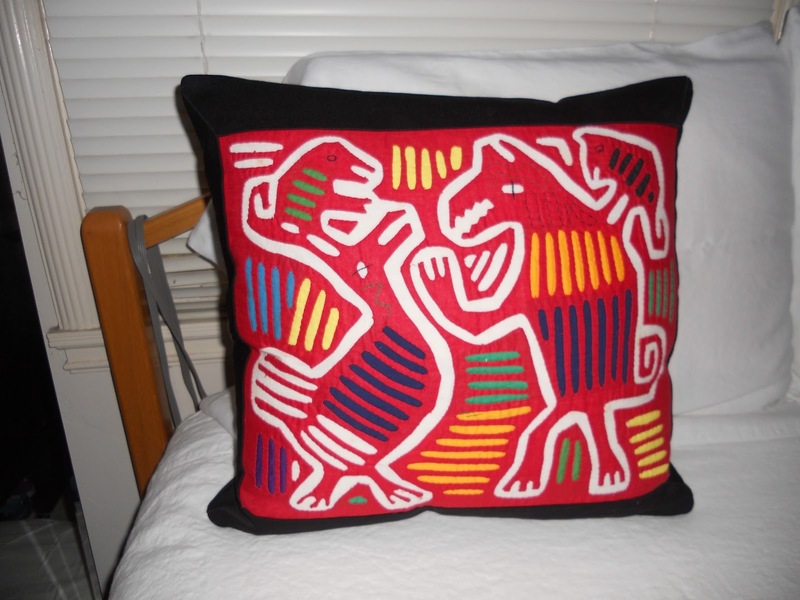 I carefully took it apart and it has a second life as a throw pillow. I am sure the designs have some kind of meaning, but I have no idea what. The work is very intricate and beautiful. I took the pictures on my bed, but in their new home, they live in a den/family room on a black leather sofa. There is one other pillow which can be partially seen in the second pillow from the top. 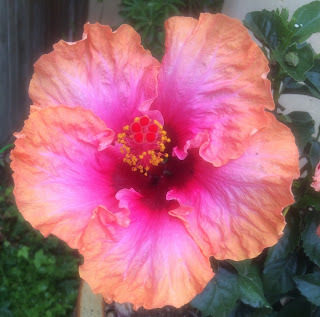 It is my favorite and I will put that one on Instagram. Yes, I did reupholster these chairs, six to be exact, with Sunbrella. And, no, I do not normally do reupholstery jobs. Chairs seats are the exception to that rule. These chairs, however, could not have been more difficult. Even pulling the old staples out was tough...I kept slipping and when finished, I looked like I'd been in a fight. My knuckles were bloody and cut up. 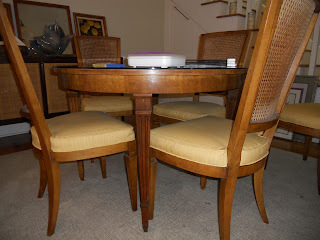 I had to do the chairs two at a time because my clients actually use the chairs when they eat dinner each night at the table. 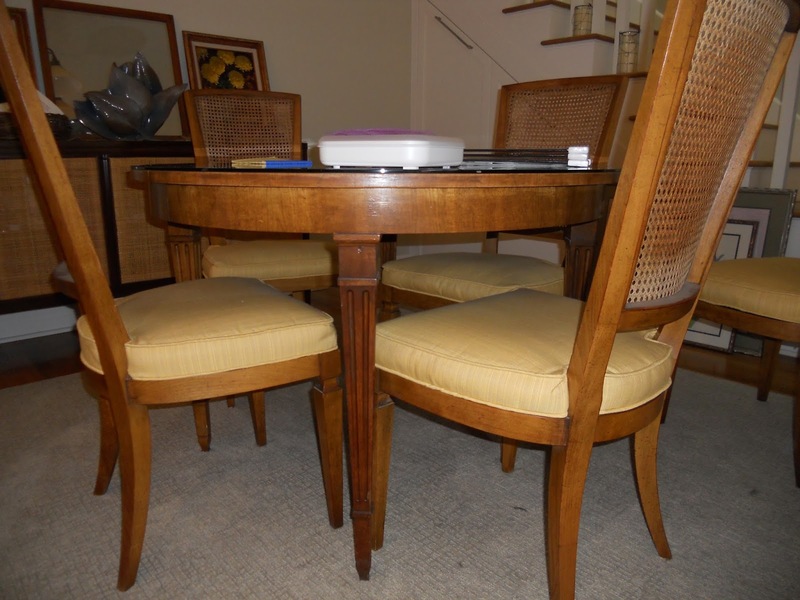 Luckily, they have four people in their family and when two chairs were at my house for an extended period of time, it was not a big deal. 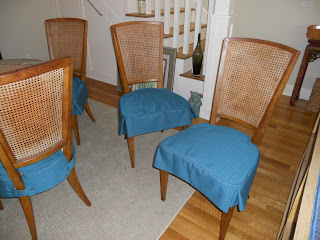 So after I finally got all 6 chairs redone, it was time to make little slipcovers, also out of Sunbrella. 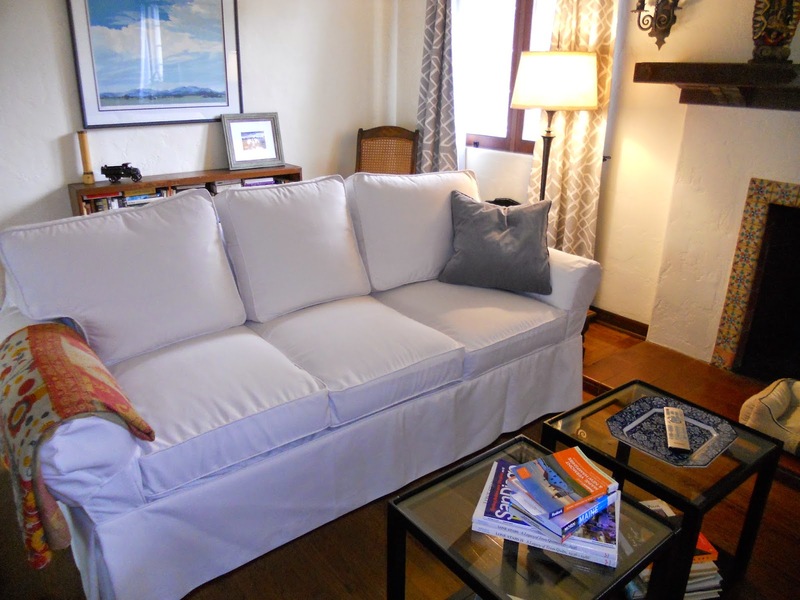 The fabric my client chose for the slips was the same as upholstered seats, just in a different color. The slipcovers have tabs were covered buttons to keep them in place. And as always, the nicest thing about Sunbrella is the indestructible nature of the fabric. My client can simply wipe off spills and if necessary, even wash them. 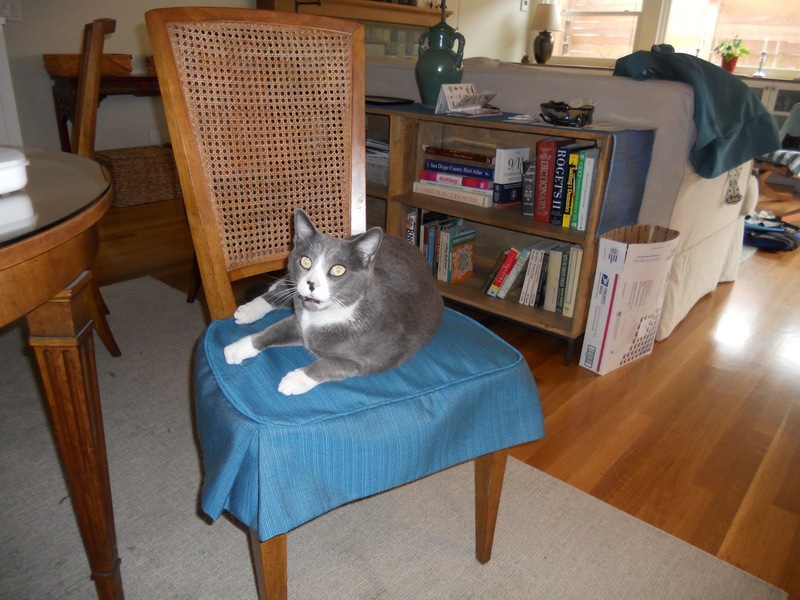 My client's cat, Bart, enjoying 'his' new seat! 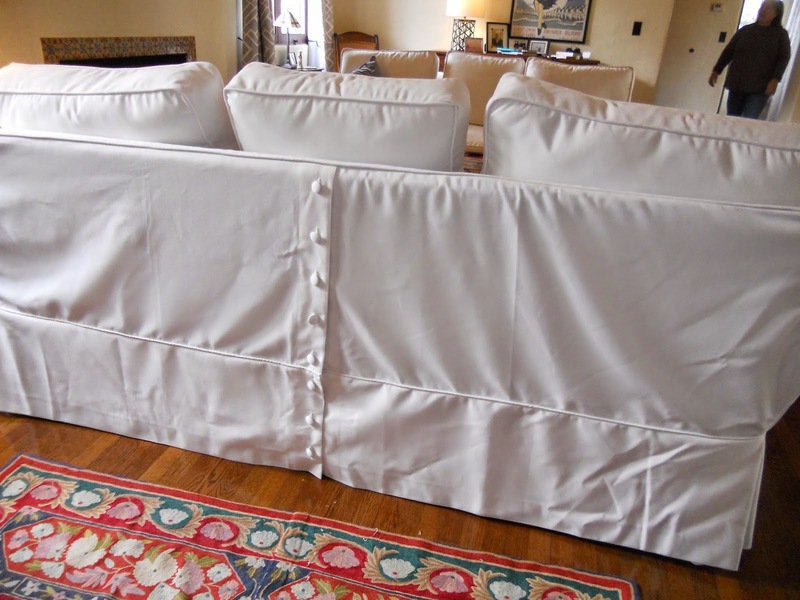 These slipcovers are done with a sailcloth Sunbrella. It is the nicest Sunbrella I've ever worked with! The fabric is very soft and feels really nice. 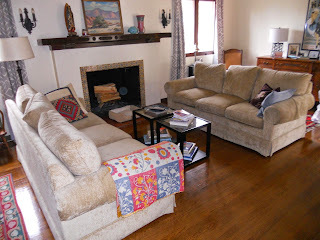 My client bought these two sofas on Craigslist from an elderly lady. 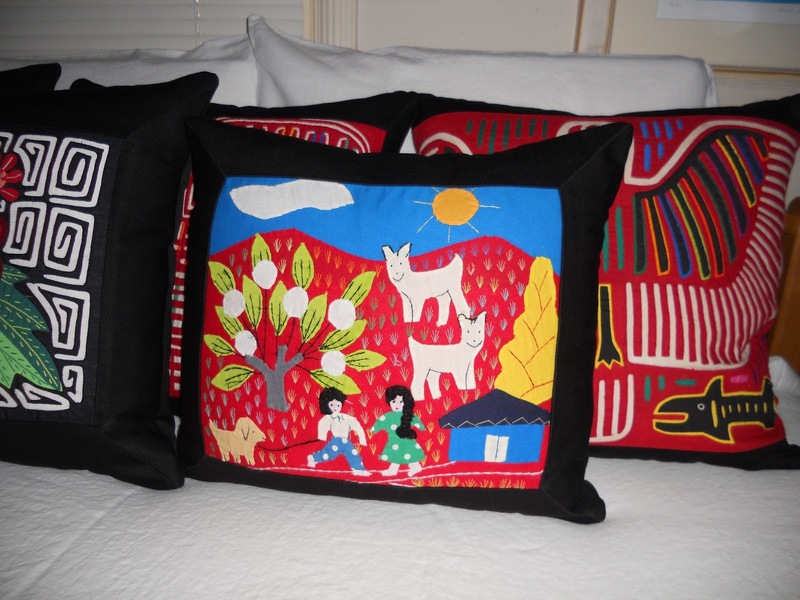 They are custom made from Calico Corners, and she (my client) paid only $200 for them! 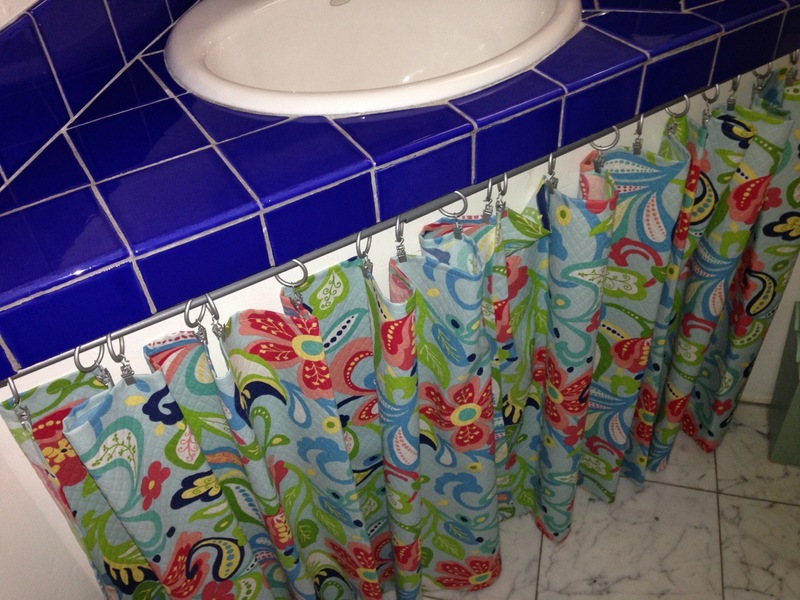 And while they were not ugly, they were not to my client's liking, fabric-wise. That's where slipcovers come in. 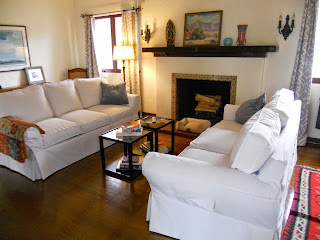 I am often asked how one should decide whether or not to slipcover a piece of furniture. I always say, if you love it and it is comfortable, do it. 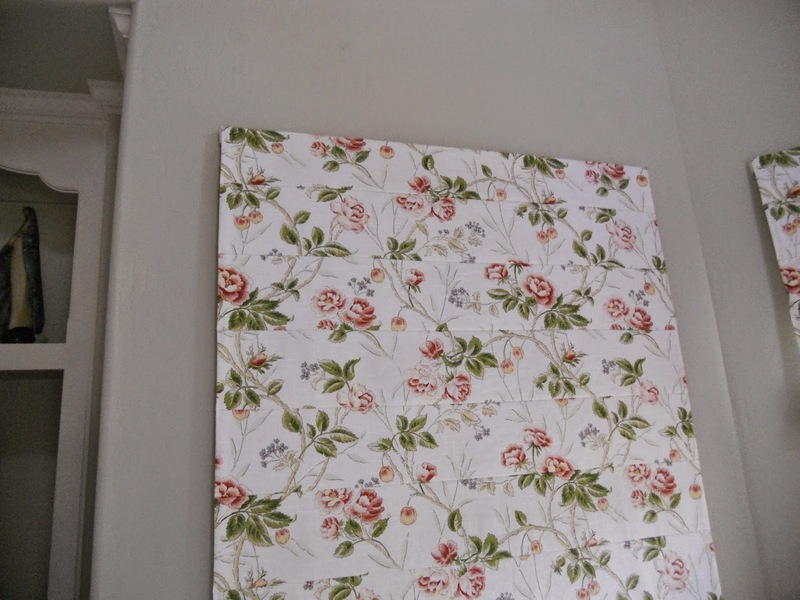 If you just hate the fabric and do not want to have it reupholstered, do it. If it is uncomfortable, don't bother. If the piece is from IKEA, don't bother. 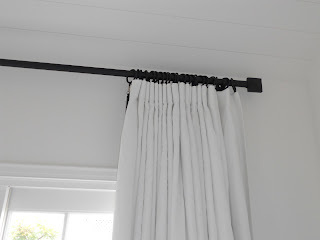 Overall, the white fabric really brightened up the room. My client was thrilled with the result and said it was the best Mother's Day 'present' she received this year. 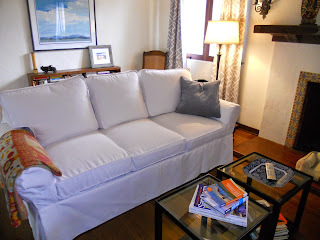 Since her kids were not around, new slipcovers were the next best thing! The before - not bad, just boring. 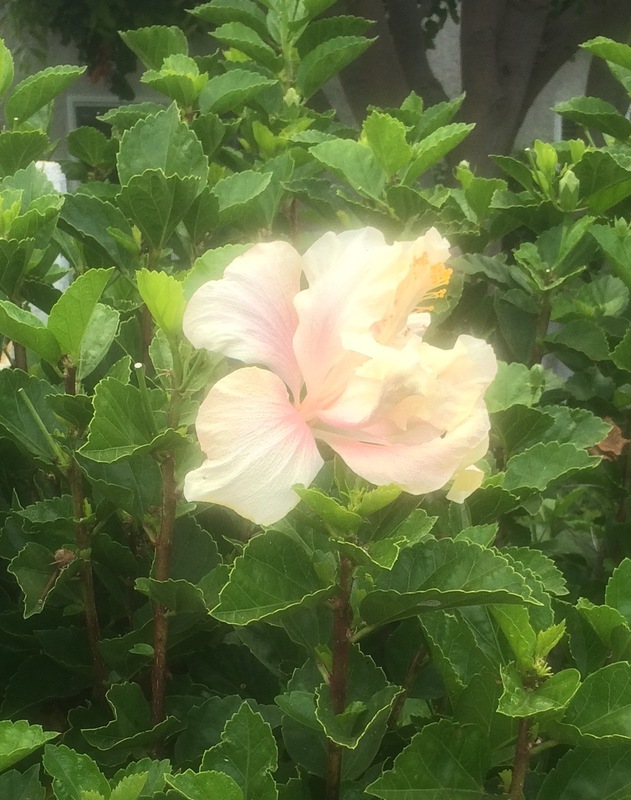 The City of Coronado was incorporated in 1890, and is celebrating its 125th anniversary this year. This Sunday, Mother's Day, is the Coronado Historic Home Tour. The homes on the tour represent six of the styles of architecture that built Coronado. 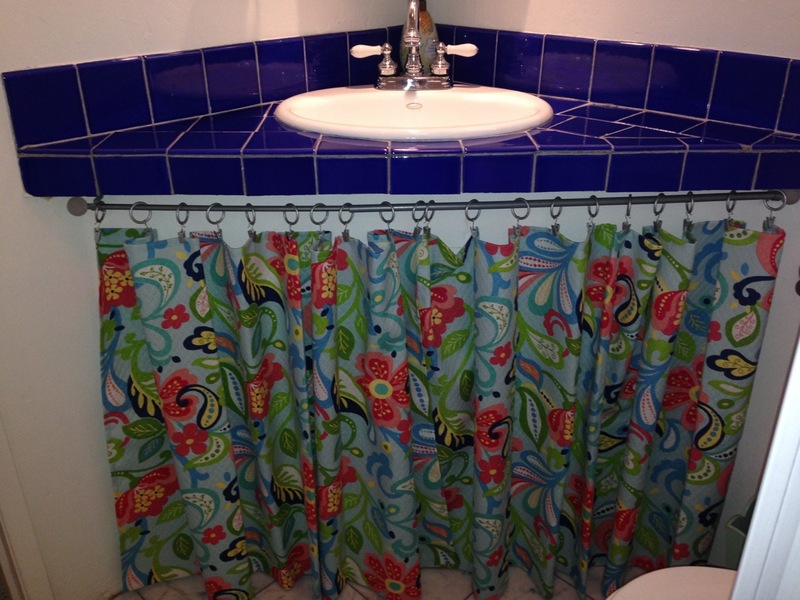 Those on the tour include Mid-Century Modern, Palmer, Spanish Eclectic, Tudor, Craftsman and Spanish Revival. In addition to these six, there are five other (addresses provided in your ticket booklet for 'drive-by' touring) typical styles constructed here over the last 12 decades, and those are: Victorian, Mission Revival, Colonial Revival, Arts and Crafts and Pueblo Revival. I have the great fortune of having done work in 3 of the 6 houses this year! And in the picture above, the Tudor, I did the sofa slipcover to the left and the chair and ottoman in the center of the picture. Also, as seen above in the picture to the bottom left, in the living room, I made the pillows, and the bottom right shows the outside patio in the back of the house, where I did the cushions. 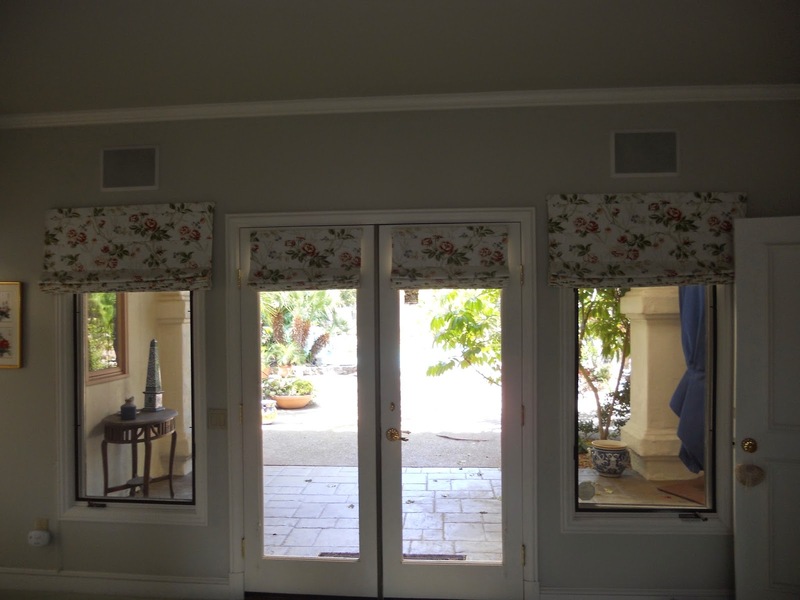 There are also various other window treatments, bedding, etc. that I have done over the last 10 or more years. 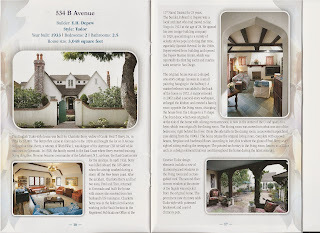 The other two homes I have work in are the Craftsman and the Spanish Eclectic. 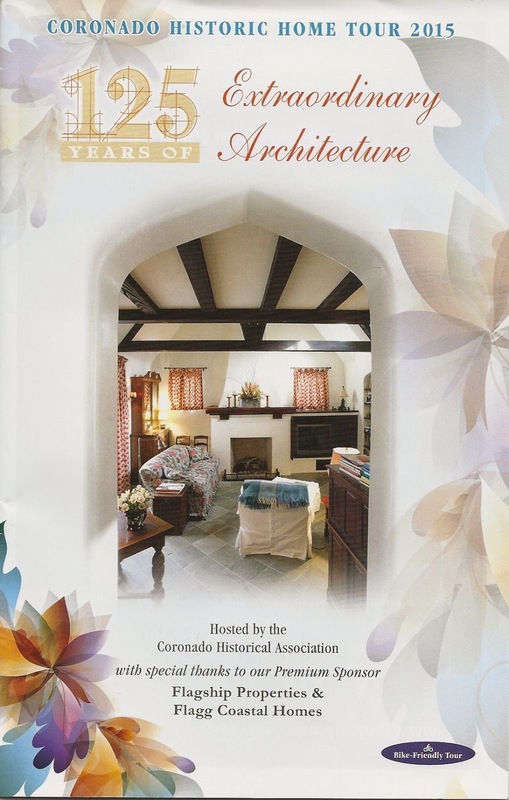 If you live locally in San Diego, I highly recommend you come to Coronado on Sunday and enjoy the exquisite homes on the tour. The hours are 11 am to 4 pm, and tickets are available at the Visitor Center at 1100 Orange Avenue. Check out the web site for more information: www.coronadohistory.org. A few weeks back I got an email from a client. 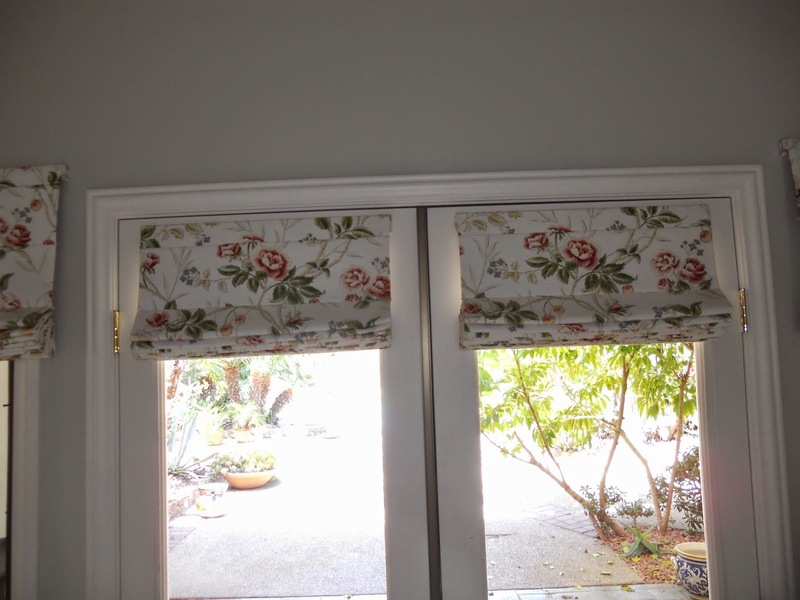 In part it said, "Hope you will remember us as you made 9 Roman Shades for our our home in Fairbanks Ranch, Rancho Santa Fe, in October 2005 when we moved to San Diego. 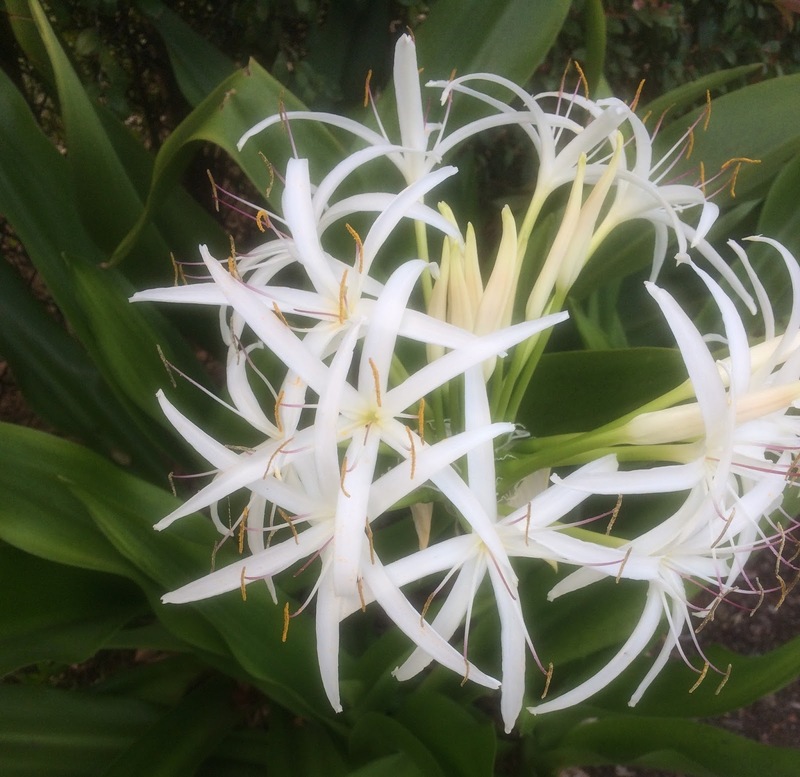 Despite being put up and down every morning and every night, they still look like new." Of course I remembered them. 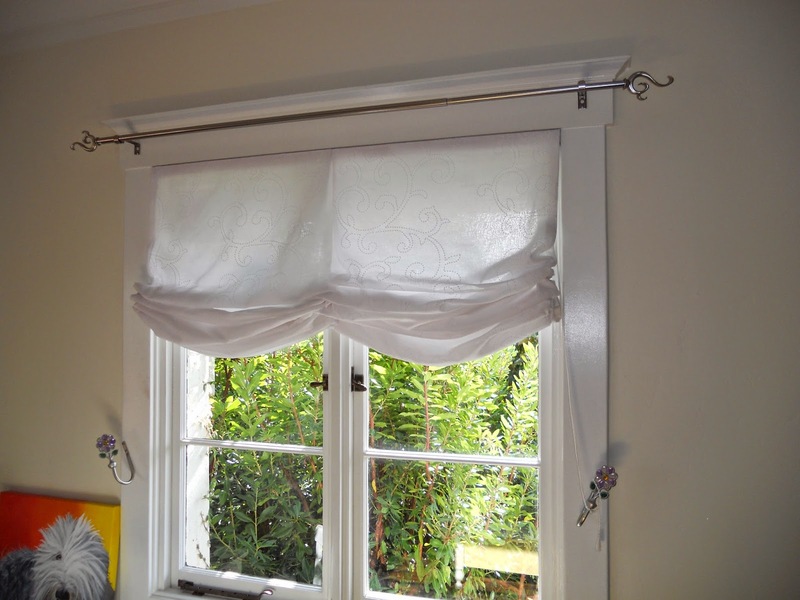 What the email also said was that, if I was interested, they needed more roman shades. 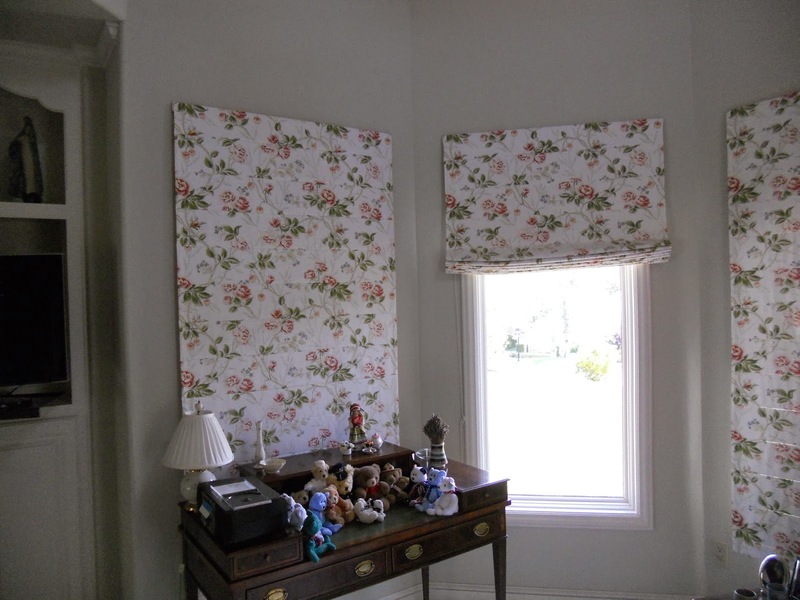 So, I went yesterday to measure and pick up the fabric for the roman shades in the guest room. As I had never gotten pictures of the ones I did 10 years ago, I took the opportunity to take them yesterday. When I first walked in the master bedroom, my first thought was, 'I did not make these.' But really, how could they think I had if I hadn't. When I looked closer, I realized that I had, in fact, made them. What I do remember about this job was how each shade, all 9 of them, came out exactly the same, and by that I mean I cut them all from the top down. So even though they had varying finished lengths, the tops were all identical. I was impressed, and so were my clients. I am happy that after all these years the shades still look really good. 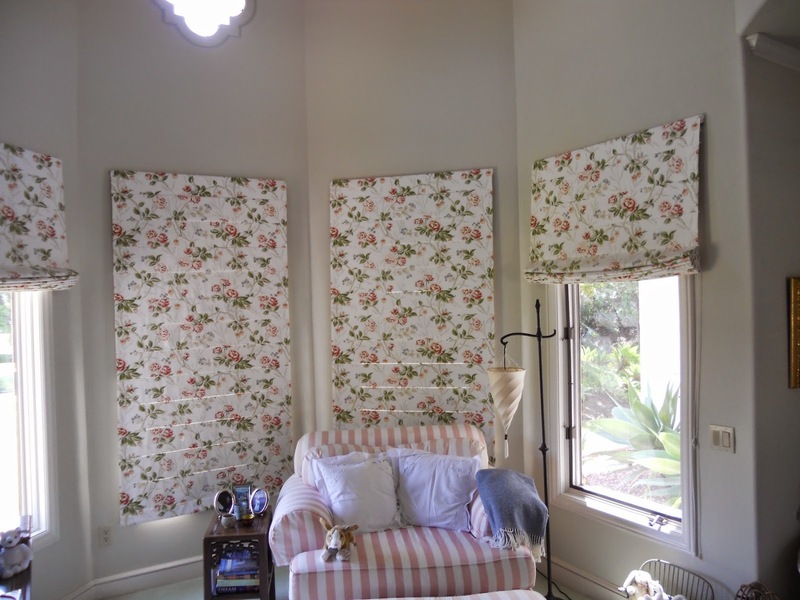 And clearly my clients are happy as well since I am making more shades for their lovely home in Fairbanks Ranch. 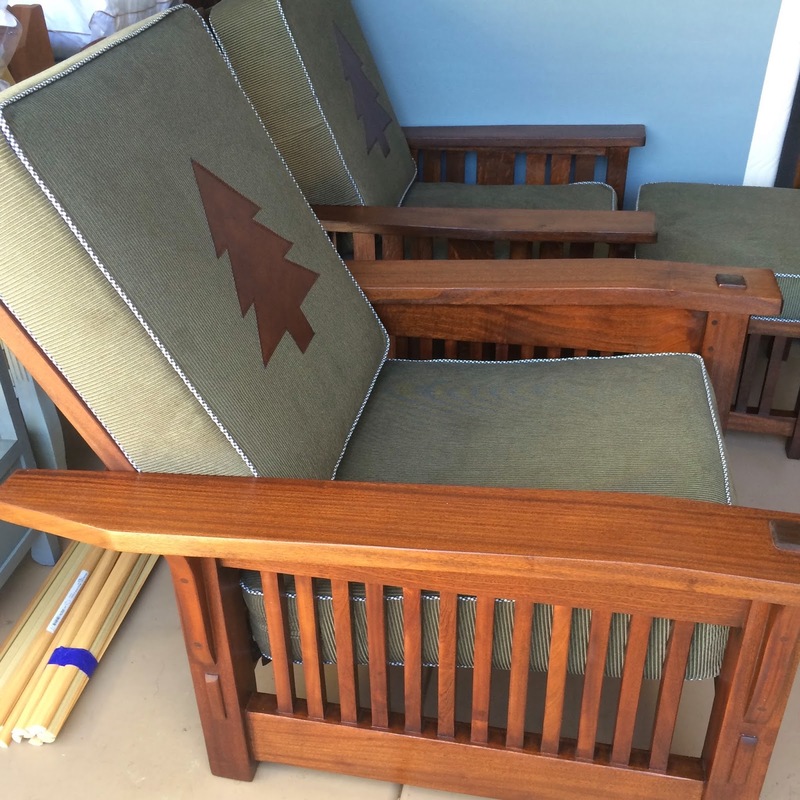 My client's in La Jolla bought a house in the mountains and had me make new cushions for the Stickley chairs, one of which was real and one a reproduction. The challenge (do I ever have a job that does NOT present some kind of a challenge?) 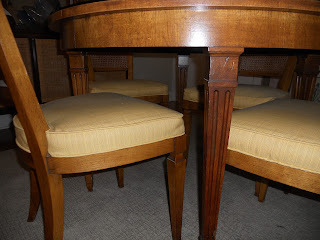 was they were two different sizes and one was actually upholstered in leather (the reproduction) and the original had a seat cushion with springs in it. To make them seem to go together better, we decided to simply replace the old cushions with new ones. 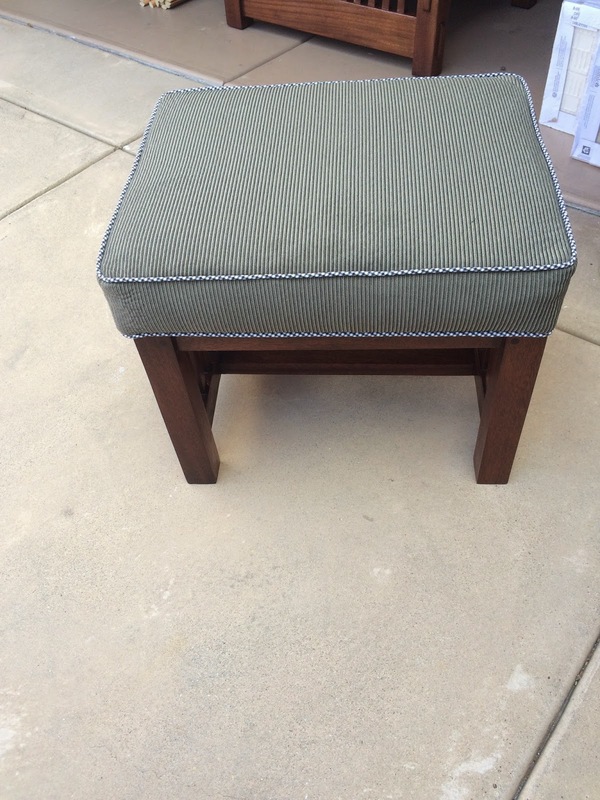 I had to reupholster the ottoman. Luckily, I was able to leave the old leather in place. 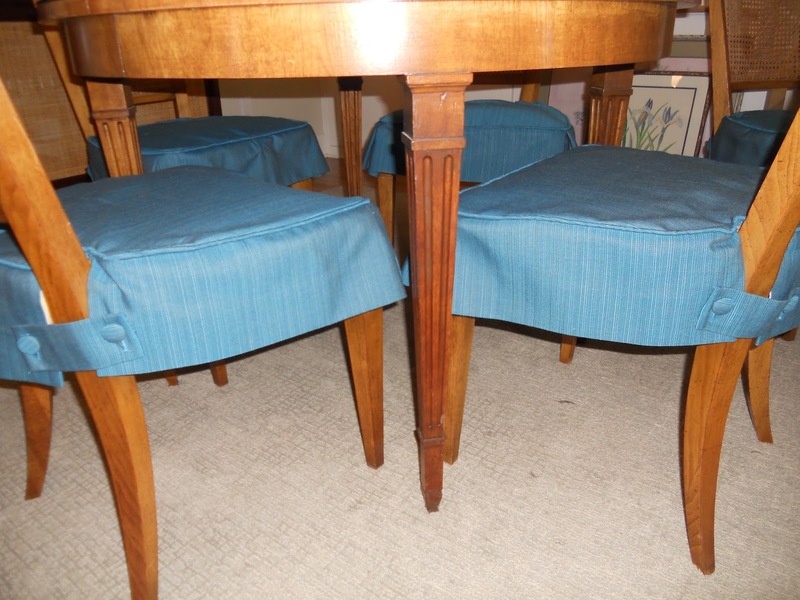 Although I am so not an upholsterer, something like this is relatively easy, which means I am able to do it without tearing my hair out. The fabric is a really soft, wide-wale corduroy with a black and white check contrast welting. 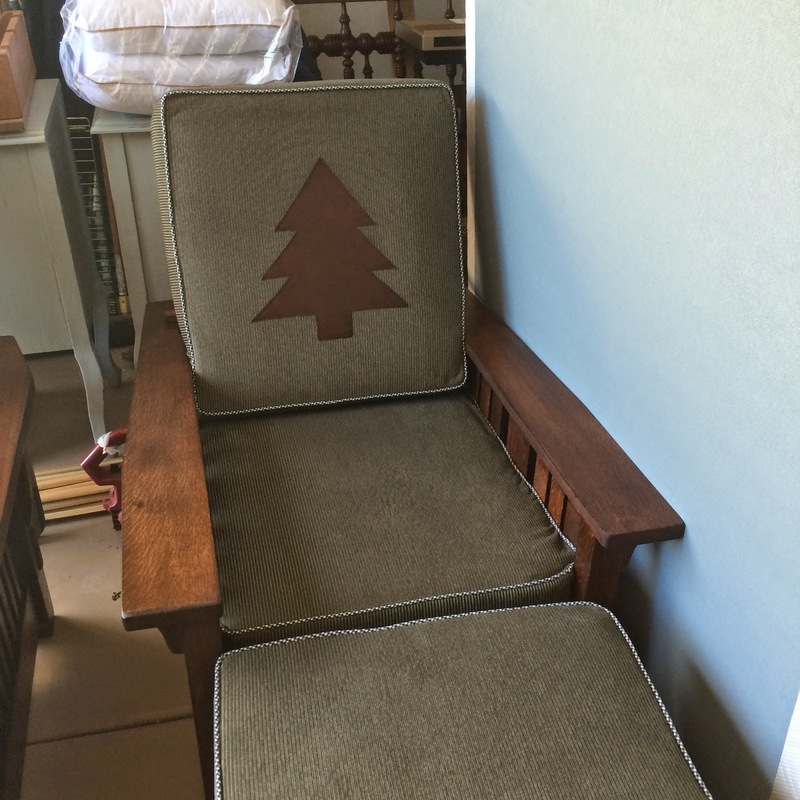 To really make them fit into the mountain house decor, I appliquéd the leather pine trees to the back cushions. 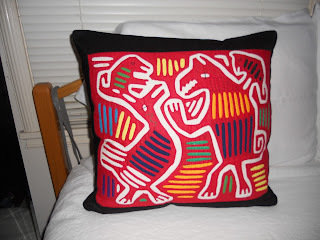 There are also two throw pillows with the appliqués for the leather sofa. And if they ever get tired of the tree, the cushions can simply be turned around. All the pictures, except the first, were taken in my client's garage before the chairs were moved up to the mountains. 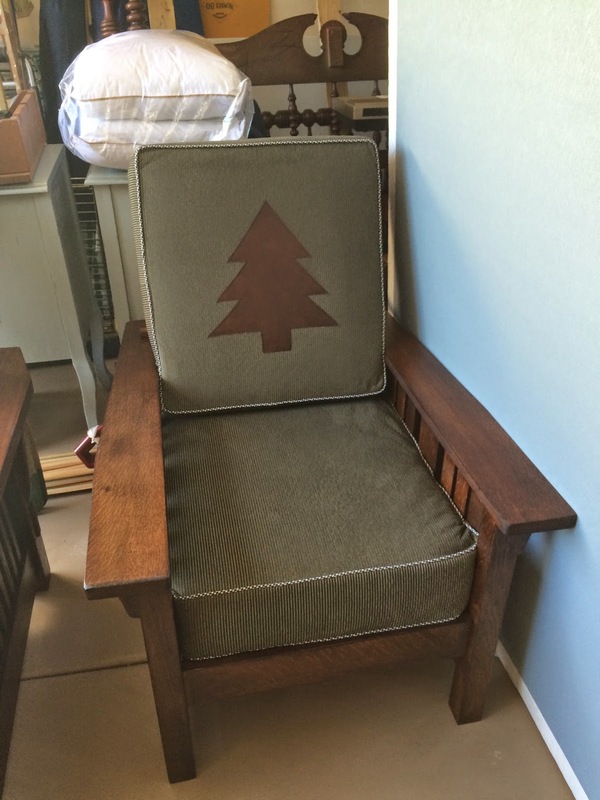 The reproduction Stickley chair and ottoman. 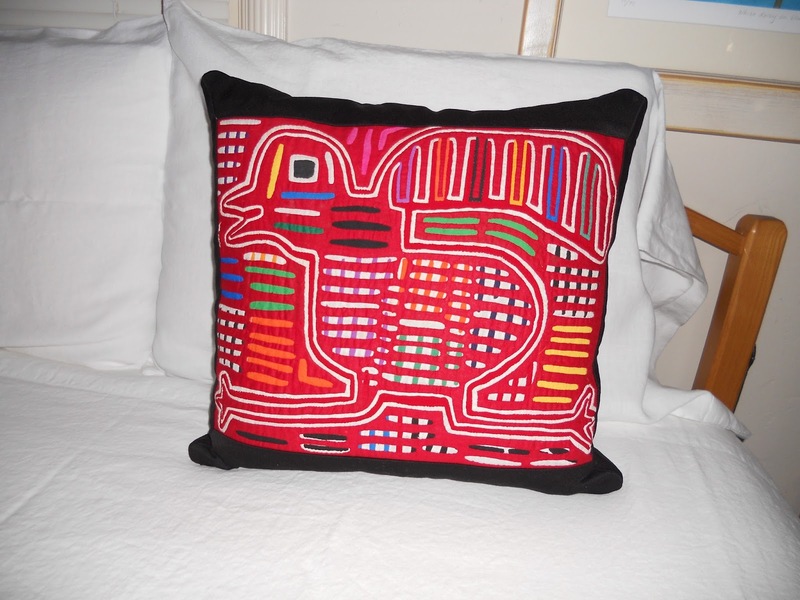 This cushion would qualify as plain, but only because it disappears into its surroundings. 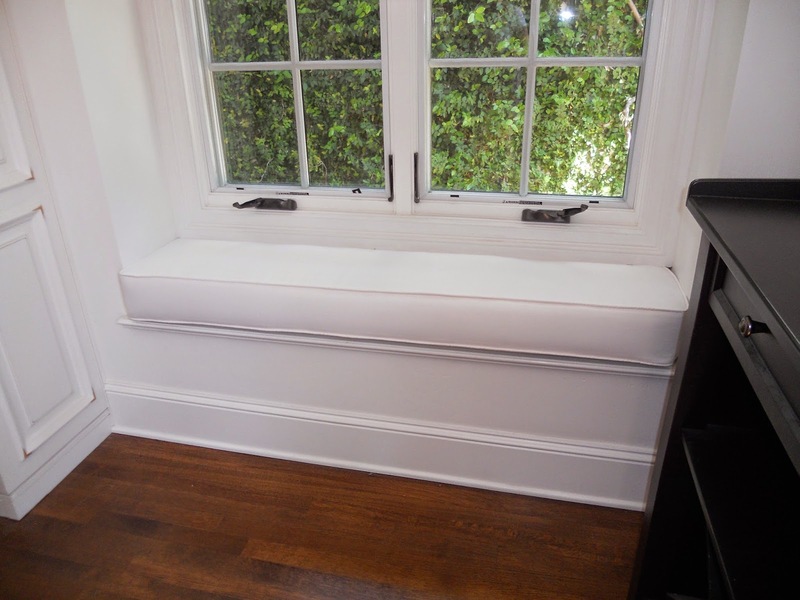 In the kitchen of my client's house this window seat adds the perfect spot to relax. The white Sunbrella makes for an indestructible cover. Because the window seat is so low, we opted to do a thicker-than-normal cushion. Plus, the window frame stuck out enough that it helps keep the cushion in place. Even though we used white, since it is Sunbrella, stains will not be a problem. On to the fancy...this chair, one of two, is in the sitting room of the downstairs guest room. 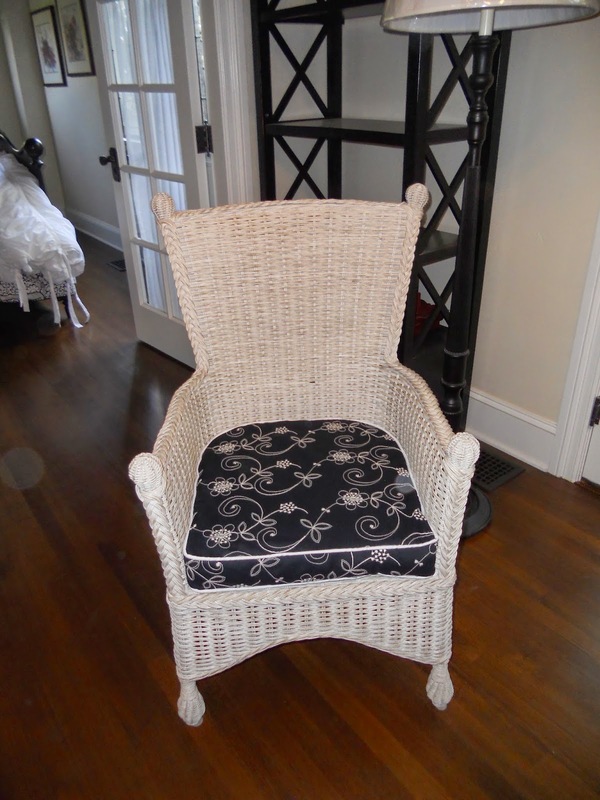 The black and white embroidered fabric dresses up the vintage wicker chairs. The contrast welting is the white Sunbrella. 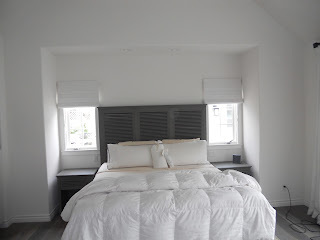 The guest room can be seen in the background. The room is predominately white with a black iron bed. 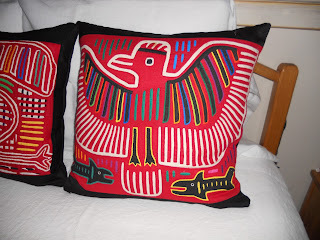 A black and white duvet is folded at the foot of the bed, and ties in nicely with the cushions in the sitting room. 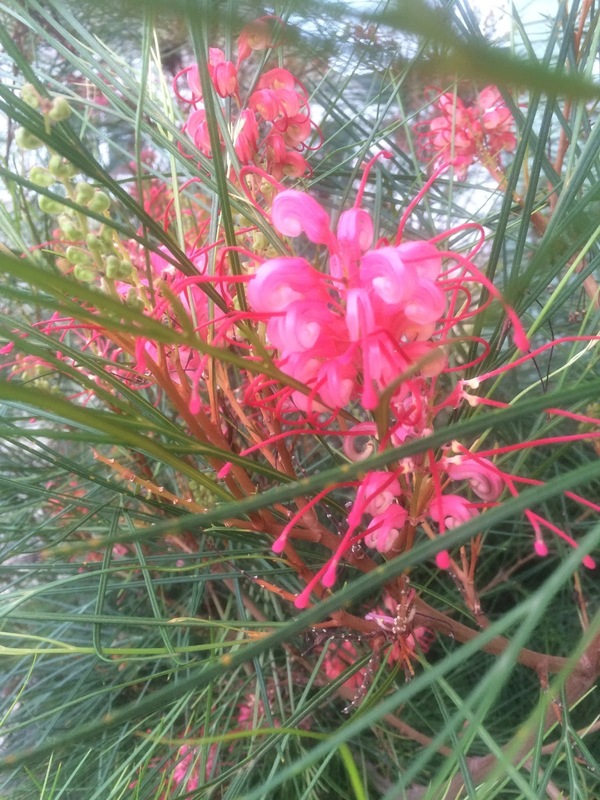 Okay, so the photos today are not so interesting in that I took the shot from one side and then the other. In my defense, I was unable to take it straight on because of the sun. This is a sort of relaxed balloon shade. Or maybe a flat cloud shade. Whatever you call it, it turned out pretty cute. 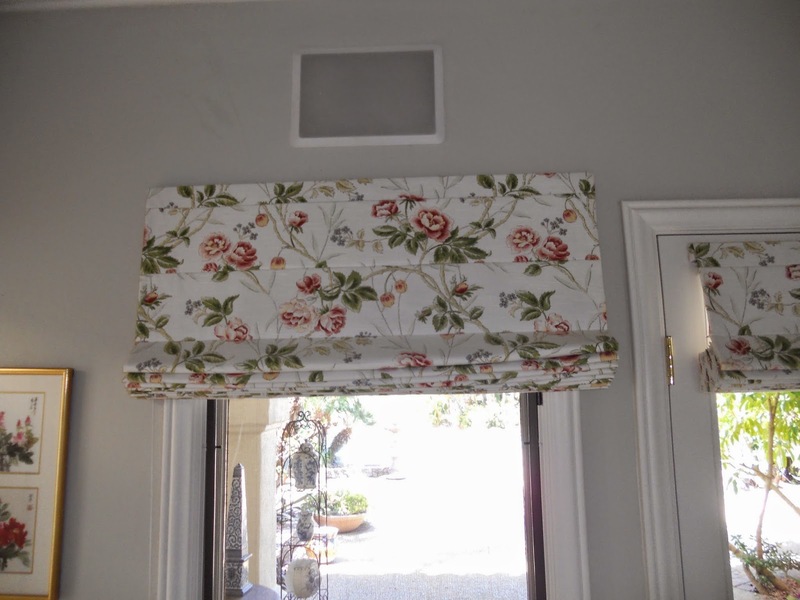 I made it from Laura Ashley panels that my client purchased at Home Goods. 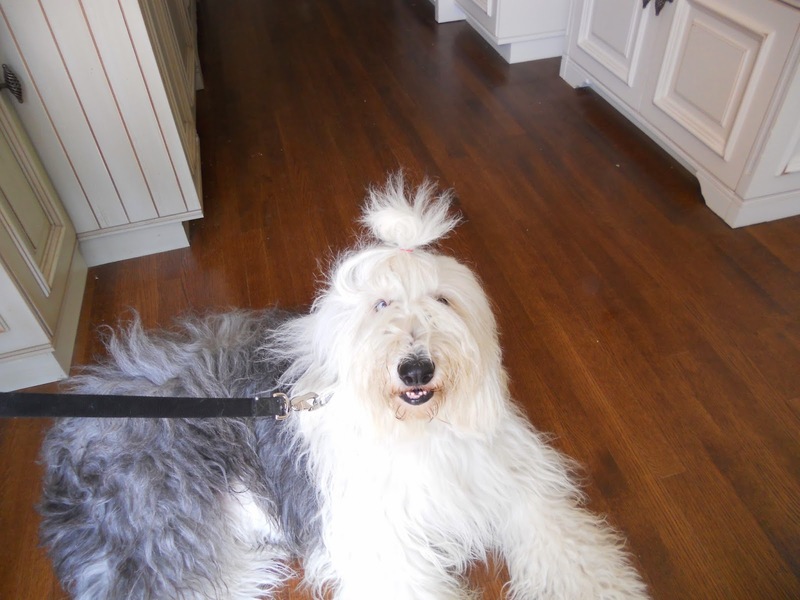 In the picture above, to the left, notice the painting of an Old English Sheepdog...my clients dog, Daisy. At the bottom of this post I included a picture of Daisy last week on her 3rd birthday. 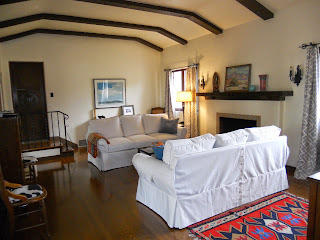 This is one of three houses here in Coronado that will be on the Home Tour this Mother's Day. Unfortunately, this room is upstairs, so will not be seen by visitors. Bummer! 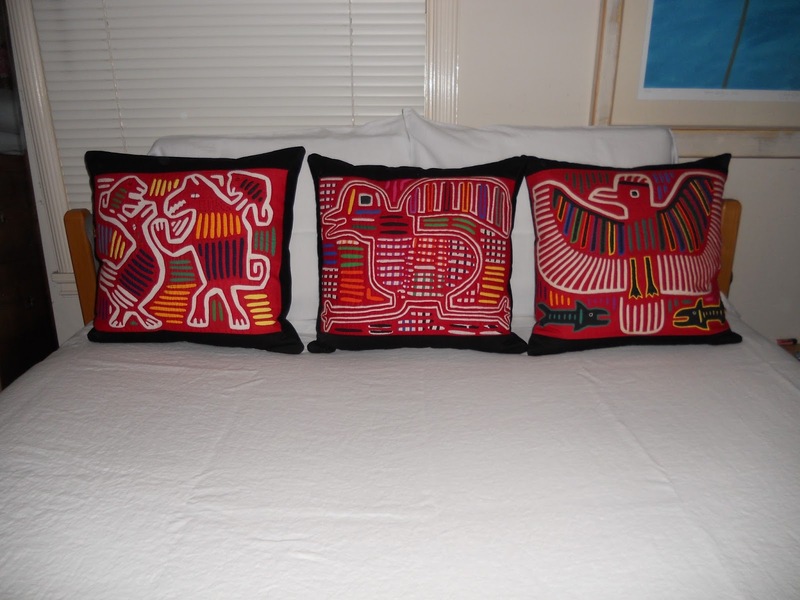 But on the plus side, I also made cushions on the first floor that will be seen. Let me say right up front that leather is NOT my favorite thing to slipcover. It's because it is a true SLIP COVER. In other words, it slips because it doesn't have anything to grab onto. The fabric we used is Sunbrella. Also, to the right in the above picture and the one below, you can see striped towels (from the Hotel Del Coronado, found abandoned on the beach) which are covering the seat cushions on the chairs I made new covers for. I'll do those in a different post. They are covered to protect the cushions from the kitty cats! The other thing I did was sew cording, which just happened to be the exact color of the fabric, on the seam line and tie the skirt to the ottoman for extra security in keeping it in place. And unless you get on the floor and look under the skirt, the ties are not visible.